Achieving appropriate nutrition throughout the year is the cornerstone of efficient livestock production. Sheep maintained in adequate body condition will achieve production targets. They will also be healthier and have fewer disease problems. Higher risk of disease and health management issues. Plan to match annual nutritional requirements with feed supply and achieve pasture utilisation without excessive use of supplements. But also know how to formulate cost-effective feeding rations for all seasons. An important management skill is to know when and how much to feed, or when to sell. Be able to recognise when each class of sheep needs supplementary feeding to achieve production targets in a cost-effective way. Successful management of the feed base will ensure you are able to balance enterprise profitability and pasture utilisation, and that sheep exceed minimum acceptable body condition guidelines (see procedure 8.3 in Turn Pasture into Product). Know the feed requirements of different livestock classes (see tool 11.1). Be able to condition score (see tool 10.1 in Wean More Lambs) and fat score (see tool 3.3 in Market Focused Lamb and Sheepmeat Production) all livestock classes and know critical minimum condition scores and fat scores (see tool 11.2) of all sheep. Key times to assess stock include weaning, 2- 3 weeks prior to joining, early-pregnancy, mid-pregnancy, late-pregnancy and lamb marking. Draft sheep into priority feeding groups based on condition score when available feed is short or sheep are approaching critical limits. This may mean allocating priority mobs to the best available pasture or supplementary feeding. Make supplementary feeding decisions early and if it is not profitable to feed some sheep consider options to reduce grazing pressure. Note: it takes nearly 4 times as much energy to increase liveweight than to maintain it. Monitor bodyweight of sheep to accurately fine-tune feeding decisions. Weighing is most important when seasonal conditions are unfavourable and supplementary feeding is an option. Be aware of the implications on flock structure and future production of selling different livestock classes. 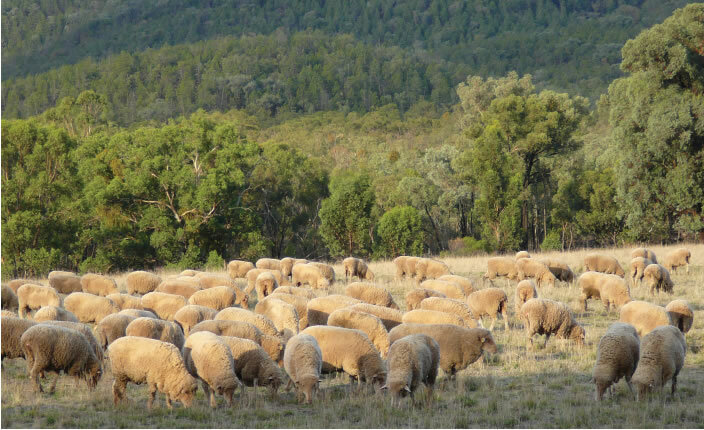 Assess pasture availability and quality and predict sheep performance (see pasture assessment techniques in tool 7.6 in Grow More Pasture). Once livestock and pasture assessments are made, make decisions about feeding management or stock sales. Appropriate levels of supplementary feeding can be provided in a cost-effective way to enable sheep to meet production targets. Assessing nutritional requirements of livestock (see tool 11.1) is important at all stages of the calendar year. Refer to the example of a farm management calendar (see tool 11.3) designed to map out key management tactics throughout the year. When feed budgeting, understand seasonal growth patterns of pasture. Aim to fit the pasture supply curve with livestock demand. Comprehensive information on feed budgeting is available from a range of sources (see signposts). Within the constraints of pasture growth and animal demand, feed budgeting enables you to better plan feed supply and demand (see procedure 8.3 in Turn Pasture into Product). Knowing the feed quality of a supplement is important for formulating rations, particularly if supplements vary in quality. Consider testing feed quality through laboratory services such as FEEDTEST® (see signposts). Energy is the essential nutrient requirement for all livestock. Stock can consume higher quantities of feeds that have higher digestibility or metabolisable energy. Purchase feeds based on the cost of energy (cents/MJ). Refer to tool 11.4 or GrazFeed® (see signposts). Protein is important for lactating ewes and growing young stock. If available pastures are green, protein will usually be adequate; otherwise protein supplements may be required to satisfy the stock requirements. The value of protein can be calculated based on the cost of protein (cents/unit of protein). Refer to tool 11.4 or GrazFeed®. Roughage is required in some circumstances. Lactating ewes grazing very short pasture (less than 600 kg DM/ha) will require additional roughage in their ration to ensure lactose production in milk. All sheep in feedlots (whether for production or drought lots) require roughage in their diets. Grains such as wheat, triticale, barley or processed pellets – and, to a lesser degree, oats – that are high in soluble carbohydrates, must be introduced carefully as there is a serious risk of acidosis. Follow the guidelines for supplementary feeding by State Departments of Agriculture/Primary Industries. Imprint feeding of lambs with ewes before weaning will reduce the time required to train lambs to eat grain. At least four to six feedings of grain are recommended over a 2‑4 week period so that lambs recognise the feeder and remember it. After the introductory period, ensure supplements are fed two or three times a week. Sheep perform better with less frequent feeding and it is more labour efficient. More frequent feeding is necessary when large volumes of feed are required for late-pregnant or lactating ewes. Malnutrition is usually a major factor in deaths of young sheep. Young Merino weaners are the most likely class of stock to require feeding, usually when pasture feed is dry and quality is poor. Weaning weight is the major determinant of survival over summer and autumn in Mediterranean climates and winter and spring in summer rainfall regions. The impact of poor growth in their first year will have flow-on effects for the reproductive performance of maiden ewes. Tool 11.1 provides guidelines for the bodyweight of weaners and maiden ewes up to their first mating. Provide high quality, clean drinking water. Water quality and quantity are important. In hot weather sheep require up to 10% of their body weight in water. Tool 11.6 provides guidelines for water quality limits for different sheep classes and tool 5.2 in Protect Your Farm’s Natural Assets is an AWI information sheet on calculating stock water requirements. In some regions, copper, cobalt, selenium and iodine deficiencies cause disease or ill-thrift. These occur seasonally in specific areas. High-intensity production systems can exacerbate deficiencies. Trace element supplementation is only cost effective when deficiencies are identified. Determine the risk of deficiency and if it is likely on your property, consult your animal health adviser. Use diagnostic tests to determine if trace element deficiencies are present. Determine the likely impact of deficiency and beneficial options for treatment and prevention (see tool 11.7 for management options). Managing sheep in droughtlots, A best practice guide. Managing fodder prices for drought, A guide to help sheep producers. Which sheep do I keep? A guide to assist producers in droughts. Feeding and Managing Sheep in dry times – a 72 page practical guide for farmers finishing lambs, feeding due to drought, designing a feedlot and much more. Trace Elements for Pastures and Animals in Victoria (1986), by Hosking, WJ, Caple IW, Halpin CG, Brown AJ, Paynter DI, Conley DN, North- Coombes PL. Victorian Government Printer, PO Box 203, North Melbourne,3051. Soil Analysis: An interpretation Manual (1999). Edited by K.I. Peverill, L.A. Sparrow and D.J. Reuter. Provides details of Australia-wide trace element deficiencies (CSIRO Publishing: Melbourne). Precision Sheep Management - keep up to date with new technologies for moving from manual, time consuming, imprecise flock management to high tech, fast flowing, accurate individual animal management, download the Sheep CRC Precision Sheep Management Glovebox guide. The Lambing Planner (tool 10.2) in Wean More Lambs. It provides a systematic basis for planning the management calendar for the breeding flock. The Veterinary Handbook for Sheep, Cattle and Goats: Produced by Livecorp, available for iOS and Android. Allows users to search by species, disease or syndrome to instantly access veterinary advice. Can be used offline.